Here's a relatively inexpensive and simple approach to get that old-home restoration look. Window trim molding can be made using your table saw with a cutter head installed. The wood can be pine, spruce or any wood of your choice. Generally software woods are best when using the triple-head cutter. Common 1x4 lumber is generally a good choice, as shown here. Avoid knotty wood, as this will not take the molding edge. Also spruce tends to fray and feather more than pine. 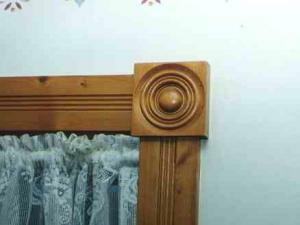 The corner "rosettes" can be purchased or be created if you have a wood lath. The commercially available rosettes generally have less depth of cut and are available in limited sizes.